The wheelchair is one of the most commonly used assistive devices to promote mobility and enhance quality of life for people who have difficulties in walking (e.g. a person with spinal cord injuries resulting in quadriplegia or paraplegia, muscular dystrophy,etc). 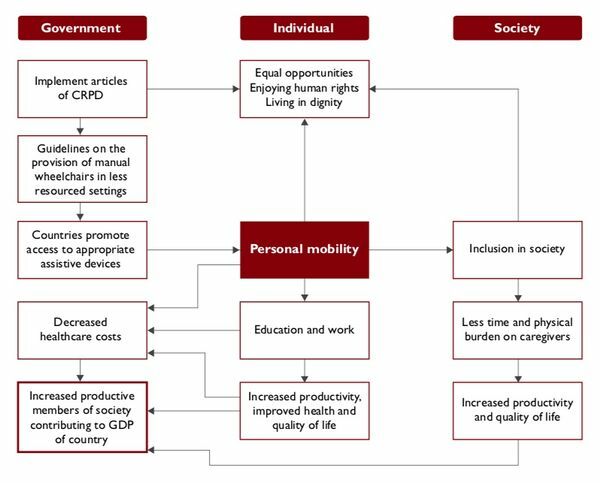 Wheelchair mobility opens up opportunities for wheelchair users to study, work, engage in social activities and access services such as healthcare. In addition to providing mobility, an appropriate wheelchair benefits the physical health and quality of life of the users by helping in reducing common problems such as pressure sores, progression of deformities and improve respiration and digestion. To ensure effective mobility, wheelchair users need a wheelchair which fits them correctly and meets their specific needs. However statistics show that about 10% of the global population, i.e. about 650 million people, have disabilities and of these, some 10% require a wheelchair. It is thus estimated that about 1% of a total population, or 10% of a people with a disability, need a wheelchair, i.e. about 65 million people worldwide. 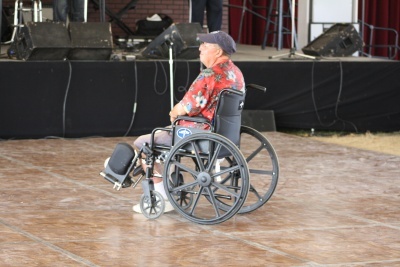 In addition, it was estimated that in 2003, 20 million of those requiring a wheelchair for mobility did not have one. There are indications that only a minority of those in need of wheelchairs have access to them, and of these very few have access to an appropriate wheelchair. The ability to adjust or customize a wheelchair to meet the user’s physical needs will vary, depending on the type of wheelchair. Wheelchairs should be available in at least a small range of sizes and allow some basic adjustments. Wheelchairs designed for temporary uses (e.g. to be used in a hospital to move patients from one ward to another) are not designed to provide the user with a close fit, postural support or pressure relief, while for long-term users, a wheelchair must fit well and provide good postural support and pressure relief. A range of seat widths and depths, and the possibility to adjust at least the footrest and backrest height are important in ensuring that the wheelchair can be fitted correctly. Other common adjustments and options include cushion types, postural supports and an adjustable wheel position. Highly adjustable or individually modified wheelchairs are designed for long-term users with special postural needs. Such wheelchairs often have additional components added to help support the user. Wheelchair designs vary to enable users to safely and effectively use their wheelchair in the environment in which they live and work. A wheelchair that is used primarily in rough outdoor environments needs to be robust, more stable and easier to propel over rough ground. A three-wheeled wheelchair that would be well suited to outdoor use. In comparison, a wheelchair that is used indoors on smooth surfaces needs to be easy to manoeuvre in small indoor spaces. Many users live and work in a range of settings, and a compromise is therefore often necessary such as a robust wheelchair with a relatively short wheelbase but large castor wheels. This wheelchair could be used both indoors and outdoors. Users need to be able to get in and out of the wheelchair easily, to propel it efficiently and to repair it. Users may need to transport their wheelchair, for example in a bus or car. Different wheelchair designs allow for wheelchairs to be made more compact in different ways. Some are cross-folding, while others have quick-release wheels and the backrest folds forwards. A wheelchair can improve the user's health in many ways. A wheelchair that is functional, comfortable and can be propelled efficiently can result in increased levels of physical activity, thus improving both physical and mental health. A well fitting wheelchair with cushion combined with adequate user training can reduce common problems, such as pressure sores, the progression of deformities or contractures, and other secondary conditions associated with poor postures. Other benefits, such as improved respiration and digestion, increased head, trunk and upper extremity control and overall stability, can be achieved with proper postural support. Maintenance of health is an important factor in measuring quality of life. These factors combined serve to increase access to opportunities for education, employment and participation within the family and the community. ↑ 2.0 2.1 Susan Allen, Linda Resnik and Jason Roy; Promoting Independence for Wheelchair User's : The Role of Home Accomodations, The Gerontological Society of America, 46: 115-123, 2006. ↑ Krizack, M. It’s Not About Wheelchairs. Whirlwind Wheelchair International, San Francisco, Ca, 2003 (http://www. whirlwindwheelchair.org/articles/current/article_c02.htm, accessed 8 march 2008). ↑ World Health Organization,World Bank World Report on Disability. Geneva:World Health Organization; 2011 (http://www.who.int/disabilities/world_report/2011/report/en/). ↑ Allen S, Resnik L, Roy J. Promoting Independence for Wheelchair Users: The Role of Home Accommodations. Gerontologist, 2006;46(1):115–123. ↑ 10.00 10.01 10.02 10.03 10.04 10.05 10.06 10.07 10.08 10.09 10.10 10.11 10.12 William Armstrong, Johan Borg, Marc Krizack, Alida Lindsley, Kylie Mines, Jon Pearlman, Kim Reisinger, Sarah Sheldon. Guidelines on the Provision of Manual Wheelchairs in Less Resourced Settings. World Health Organization; Geneva: 2008. ↑ Tolerico ML, Ding D, Cooper RA, Spaeth DM. Assessing mobility characteristics and activity levels of manual wheelchair users. Journal of rehabilitation research and development. 2007 May 20;44(4):561. ↑ Howitt J. Patronage or Partnership? Lessons Learned from Wheelchair Provision in Nicaragua [Thesis]. Georgetown University, Washington DC, 2005. ↑ 13.0 13.1 Rice IM, Wong AW, Salentine BA, Rice LA. Differences in participation based on self-esteem in power and manual wheelchair users on a university campus: a pilot study. Disability and Rehabilitation: Assistive Technology. 2015 Mar 4;10(2):102-7.